The Rode VideoMic and Custom Windbuster Kit from B&H provides a shotgun microphone that can easily be mounted on a DSLR camera and adds an extra layer of wind noise protection. The VideoMic is lightweight, and when mounting on a camera it does not appear in the frame. Its Rycote suspension system attaches to the camera's shoe. The VideoMic's super-cardioid polar pattern attenuates sounds from the sides. The result is a signal that sounds closer to the camera, even when shooting in noisy environments or at moderate distances. The Auray Custom Windbuster is made of an artificial fur material for maximum protection against wind noise. The Custom Windbuster slips over windscreens for added protection and measures approximately 7 to 7.5" (17.8 - 19cm) in length. The Auray WSW Series Custom Windbusters provide dual layered wind protection and are designed to substantially reduce unwanted broadband wind noise and vocal pops with minimal high frequency loss. This WSW-007MKII Custom Windbuster fits shotgun mics up to 7"(18cm) in length and is designed to be slipped over existing foam windscreens up to 5cm in thickness. The simulated fur outer layer works in tandem with the acoustic cloth inner lining to protect the microphone element from air bursts without muffling the sound. When used on a shotgun mic, this windbuster is effective in minimizing wind noise and plosive sounds. It is most effective in light breeze to moderate breeze conditions (4-17 mph) and users can generally expect a 30dB to 40dB reduction in wind noise with modest dampening of high frequencies. For most applications, the modest high frequency dampening is a worthwhile exchange for the substantial wind noise reduction. In addition to dual layered wind protection, the WSW-007MKII helps prevent moisture and dirt from damaging your microphone. The WSW-007MKII Custom Windbuster for Shotgun Microphones offers an extremely effective dual layered solution for wind protection. VideoMic and Custom Windbuster Kit is rated 4.6 out of 5 by 17. Rated 5 out of 5 by MissCarly from Buy From HERE! Authorized Dealer of Rode!! I initially bought this off @, when I rec'v it, and tried to register it, it said it was already registered! THEN! Come to find out, the Rode website mentioned that there are fake Rode Mic's being sold on @! Who Knew! The Rode Website gave a list of authorized Rode dealers, Out of the whole list, I choose B&H due to the packages they offered and GREAT Price! My Mic came in super fast shipping, it was super easy to put on, I actually enjoy using a battery for this, since it will not eat up my camera battery. Very Happy with the sound output with this model. I'm new to recording, this seems like the best one until I need to upgrade! Rated 4 out of 5 by Rob from Good Quality - just know what you are buying. Huge improvement over the on camera mic and good quality, but it can't perform miracles and starts to sound hollow once you get more than 5 ft. away that worsens with distance. For static shots / interviews, I am using a 10' extension cable and attaching the mic to a small tripod just outside of the frame - the results are great. If you do this, moving the cable while shooting can result in crackle - a result of the smaller 3.5 mm audio jacks. Rated 5 out of 5 by #photopro from Hella dank Really good. Had a great time. Wouldn't trade it for any other mic. Great for live music! Rated 5 out of 5 by Richard from Excellent! Works great. nice quality. 100% better audio than the built in mic. Rated 4 out of 5 by Jimmie from Rented It, Liked It, Bought It I rented the VideoMic to record my nephew's outdoor wedding. The site was pretty, overlooking a valley, but with a major highway parallel and about 250 feet away. Due to restrictions I set up behind the guest seating with a Nikon D7100 and the Rode. Traffic noise picked up by the mike was minimal and I was able to get clear audio from about 30 feet away with the low pass filter engaged. I was so impressed by the VideoMic performance that I bought my own with the Custom Windbuster Kit. In a wind, there is still some wind noise, but it is minimal compared to the in-camera microphone where the wind just howls. I bought the 10' extension cable so I can use the microphone off-camera with a helper or mike stand. It is a little big for on-camera use, but I've had no problems. Like others, I wish all the controls were outside the battery compartment, but it isn't really a problem as long as you plan ahead and set them accordingly. Rated 5 out of 5 by ksiko from Simply great! This mic is so wonderful. It's very easy to use and it has great audio quality for it being less expensive. The shock mount is near flawless and the build quality is great for the price. I didn't think I needed the extra dB boost on the pro so I chose this and couldn't be happier. Great mic for the low cost and definitely a good beginner mic. Rated 5 out of 5 by Aamyie from Great purchase This was an even better than expected purchase. The quality of sound with my videos has improved. I've received many compliments on the difference. Does this microphone work well with a Tascsm DR-22WL audio recorder? Is this compatible with a Fujifilm XT-1 if I get a 2.5mm -&gt; 3.5 mm adapter? The Rode VideoMic can be used with the Fuji XT-1 using the proper 2.5,mm to 3.5mm adapter. Does it work with Sony A6500? The Rode VideoMic is compatible with the A6500. Does the mic work with a Sony a6300? It will not plug directly into the a6300 mini 1/8 input. Look for a battery powered microphone with an 1/8 output jack such as from Rode or Senneheiser. what's the difference between the videomic and the videomic go? 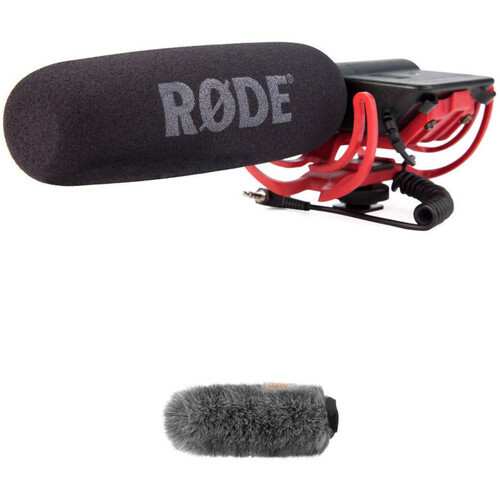 The Rode VideoMic is a battery powered mic with a higher quality capsule and shock mount system. The VideoMic GO requires external power from a compatible camera and offered as a budget alternative to a cameras built in mic.